The US Air Force must have been listening to EU Referendum. 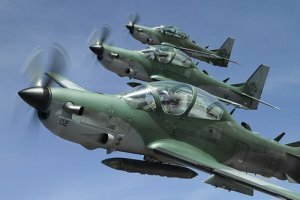 They want some light attack aircraft for counter-insurgency work. Photo is Brazil's Super Tucano.�Nice little airplane, and it looks like it would be fun to fly to Cape Cod for the weekend - or low over Sadr City. A-1 Skyraider. Would be just the ticket for low & slow air support over there. my son's pilot instructor was an ex-Skyraider jock. He loved it. I think it could haul as much ordnance as the WWII four-engine bombers (maybe not the B-29). Spent a lot of time on the radio with Marines flying the OV-10. Slow and lots of loiter time is the way to go once the bad guy's Air Force is gone. Gotta agree with Skyraider and Bronco though.